Parking is free at the Dee Events Center. Shuttle buses will run every 20 minutes to provide a free shuttle. 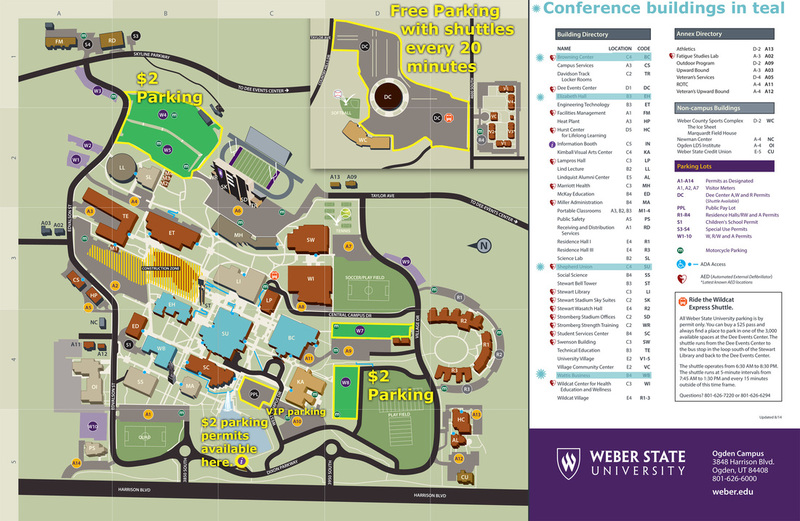 If you decide to NOT park at the Dee Events Center and use the shuttle provided , you will need to go to the information booth on campus and purchase a $2 parking permit for each day. If you do not purchase a pass, you will receive a ticket. Parking at the PPL lot is reserved for VIP Ticket Holders and Handicap Parking. Please locate parking options on the maps below. There are three choices available. 2- We are going to have free parking shuttles running every 20 minutes from the Dee Event Center as an added convenience. The buildings we are in are called SHEPHERD UNION, WATTIS BUSINESS BUILDING, BROWNING CENTER & ELIZABETH HALL. They are highlighted in teal on the map. If you are northbound on I-15, take exit 324 near Lagoon. Travel north on US-89 to Harrison Boulevard turn right (North) on Harrison Boulevard and go approximately 3 miles to 3950 South. Turn right (East) on 3950 South and follow directional signs. If you are Southbound on I-15 take the 21st street exit. Continue east to Harrison Boulevard (Approximately 4 miles) Turn right (South) on Harrison Boulevard and go approximately 3 miles to 3859 South. Turn left (East) and follow directional signs.